Every Huckabee supporter needs to call CNN to complain about the way he was ignored during the debate and in the after debate discussions. It was outrageous, IMO, the way he got much less air time than any other candidate. He was brilliant whenever he was able to speak but air time counts for a lot when debate performance is discussed and Huckabee was cheated, plain and simple!!!!! We cannot allow this to happen without flooding CNN with complaint calls. The number is 404-827-1500 opt#2 then opt#3 then leave a message after the beep. I don't know if complaining will help, and it's not like Huckabee hasn't been here before. They wish he wasn't around... but he's going to be harder and harder to ignore. When CNN didn't even include Huck's name in their commercials they ran promoting the debate (the only candidate they didn't mention), you knew what was coming. That the brilliant minds at the GOP would subject their candidates to not only a debate on a left leaning network like CNN but also to the hours of inane and biased analysis by the left-wing CNN "experts" is inexcusable. And you wonder why we can't beat the likes of a clownish Barack Hussein Obama?!! The Dems would never let their candidates get subjected to a charade like last night. Goalieman, you are correct. The RNC needs to make sure of the rules of the network's debate beforehand and make sure this does not happen again. Governor Huckabee was placed too far out on the stage and given too little time for his popularity and polls. Fiorina was placed too close to center and given far too much time, as was Trump. This was more a "show" than a true debate. I think a smart move would be for Huckabee and Bush etc, approach the Republican Governors Association about arranging a governor's roundtable forum. 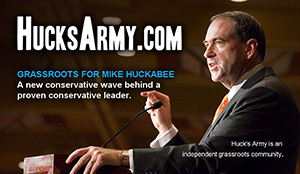 Perry could host them...somewhat in the vein of Huckabee's forums in '12. On another note, I wonder why Huck didn't appear at the Heritage Foundations confab last night? Seemed like a good opportunity to get his message out. I guess Hannity believes "wishful thinking" will make it so. Do you have a link to that poll, goalieman? BTW, I like your name because it shows you are conscious of how important goals are. Whether in life or in soccer. if you change the filter to likely voters he is 7th, behind Cruz and Fiorina. Also, he was speaking at a previously arranged event in California so he couldn't make the Heritage Foundation confab. My username is due to my previous hobby of being an ice hockey goaltender.........now I'm trying to stop political nonsense like Hannity's comment from going into the net, LOL! I actually went to the Huffington Post to find the latest polls, as much as it pains me to ever visit that site. Real Clear Politics only includes certain polls, so one has to look elsewhere sometimes to see all of them. Hannity is really much like those on the left who tell you what they want to be reality, not what really is real. It's all trying to create a narrative in hopes that it becomes reality. Welcome to the world of politics!